A radical departure from “normal” keyboard designs, the Kinesis Advantage is not generally the first stop on one’s ergonomic journey. That’s okay, because more moderate designs can work with great effect. If, however, other measures have failed, this may be a step you want to consider taking. Read on for my take after having used one full-time for about a month. The Kinesis Advantage contoured keyboard is probably the second-weirdest-looking keyboard on the market, the first-weirdest being the Safetype vertical keyboard. (I’m only counting devices that remain somewhat recognizable as keyboards, by the way, so that leaves out the orbiTouch and other bizarre creations.) 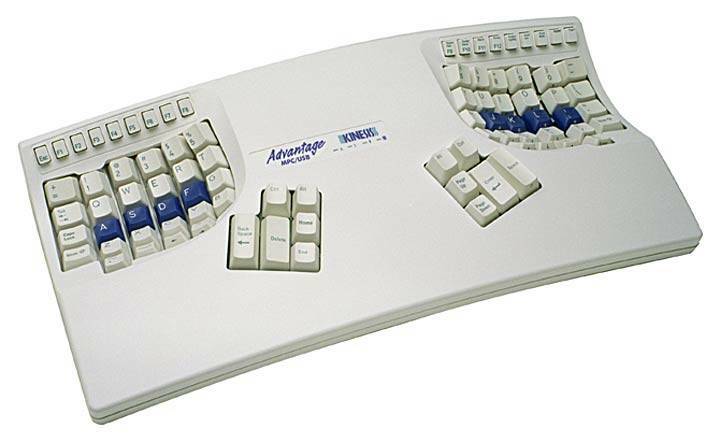 The Advantage takes the “split” layout of a standard ergonomic keyboard and turns it inside out, with the letter, number, punctuation, and arrow keys placed in two bowl-shaped “wells” on either side of the board. Enter, Space, Backspace and certain other control keys are found on the center “island” and struck with the thumbs. The function keys (F1-F12) are demoted to squishy little rubber things which we’ll look at in more detail later. Like some other ergonomic keyboards, the Kinesis Advantage scraps the numeric keypad in order to narrow its footprint and leave more room for the mouse on your desk. This is fine with me as I rarely use ten-key anyway, but might be an obstacle for you. Like a laptop keyboard, the Advantage does have a ten-key pattern on the right section of letter keys, which can be activated with the “keypad” button at the top right. The layout of the Kinesis Advantage allows it to offer some pretty unique ergonomic benefits. To start with, the two halves of the keyboard are further apart than any conventional split keyboard (to my knowledge, only Kinesis’ own extra-wide Freestyle model has a wider gap). This allows your arms and wrists to reach almost straight out while typing, instead of being scrunched and twisted into the posture of a standard keyboard. Your palms can rest lightly on the front part of the board, while your fingers float over the concave key wells. Note: As with any keyboard, you should avoid resting your hands completely on the keyboard (or on anything else) while you are actually typing; those parking places are intended for partial support while typing, and micro-breaks in between phrases. I wish I could say that adjusting to the Kinesis Advantage was really easy, but for me at least, that wasn’t the case. I did quite a bit of growling during the first couple of days I owned mine, not because I couldn’t find the keys, but because the keys I found weren’t the right ones. My biggest problem was under my left thumb. On ordinary keyboards, even split models like my old faithful Microsoft Natural Elite 4000, the space bar is just like that of a typewriter – you can tap it with either thumb. To spread the load around a bit, I have developed a habit over the years of alternating thumbs on the space bar while typing. This is great until you start using a Kinesis Advantage, which puts the space bar on the right side only; the left thumb rests on Backspace. I’ll leave you to imagine the mess that’s made of your copy when every other space is replaced by a backspace…. Having adjusted to the Kinesis, I now have some trouble typing on regular keyboards. I can still find my way around on a straight board, of course, but I have to look at my fingers in order to go anywhere near as fast as my benchmark typing speed, without making a large number of errors. Once I got used to the Kinesis Advantage layout, I found that I really liked many things about it. I can now hit Delete, Backspace, Home, End, and the arrow keys without looking down or moving my hands, which is really nice because I use those keys a lot. On the downside, the brackets () and tilde (~) keys are quite hard to hit, and I also use those keys frequently. Whether or not the default layout works well for you comes down to which keys you use the most in your daily activities. In the end, however, the layout can be almost anything you want, because of the onboard remapping and programming feature of the Kinesis Advantage and Advantage Pro. The current Kinesis Windows keyboard layout – click for larger view. This view is a little distorted and makes the two halves appear closer to each other than they really are. With the Kinesis Advantage, you can remap keys right on the keyboard, without having to install anything on your computer. I, for instance, could theoretically have remapped Backspace to Space, which would have helped me out with the alternating-thumbs issue (I couldn’t actually do this because I use the Essential version, which has no programming ability). To make things even easier, same-size keycaps can be swapped to reflect your new mapping pattern. There’s a special tool available for this, or you can just use two paper clips and plenty of caution. The Advantage and Advantage Pro also have onboard macros, so programmers and efficiency freaks can create stored shortcuts right on the keyboard, which will work on any computer. There are stick-on palm pads available for the Advantage. I bought a set to go with mine, but they weren’t nearly as soft or smooth-feeling as I’d hoped. Fortunately, the glue on these palm pads is of an easily removable type and doesn’t leave any goopy residue on the keyboard. You can also stick them back on after having removed them, which I have done several times, without much reduction in stickiness. The standard keyboards that ship with consumer PC’s generally use rubber-dome keyswitches – little rubber cups that make the keys feel mushy and increase the stress on your hands. Proper key switches are expensive, which is one of the main reasons that good ergonomic keyboards are also expensive. Is a high quality keyswitch worth the cost? To answer that question for yourself, you really have to type on one. In my experience, the springy, responsive Cherry brand key switches used in the Kinesis keyboard help make typing a singing pleasure rather than a grinding chore – so yes, they’re definitely worth it for me. After years of goofing off under the desk, your feet can now be put to work using an optional Kinesis foot pedal system that plugs right into the Advantage keyboard. By default, the pedals activate Shift and the numeric keypad, but you can presumably remap them to whatever you want. I am toying with the idea of this feature, but for now I don’t feel like I really need it. 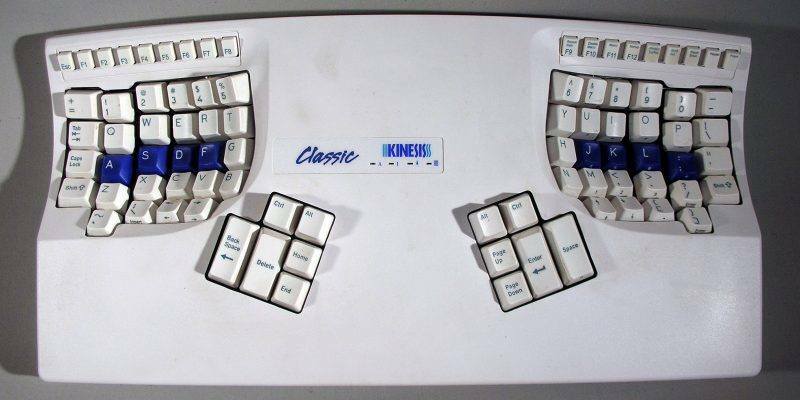 Once the main keyboard keys were put in the Kinesis Advantage, the designers had a problem: There were eighteen essential keys left, and only twelve slots. Their solution was to move ESC, the F-keys, and several others to the top row of the keyboard, and make them small rubber buttons instead of full-size mechanical. This may not be a problem for journalists and bloggers, but it is an issue for RSI-suffering programmers and web developers, who tend to make extensive use of the F-keys. Also, it’s nearly impossible to remove these button assemblies for the cleaning which is sometimes needed, because they are held on with melted plastic tabs instead of screws. If the button response starts getting sketchy, you basically have two options: Live with it, or send it back to Kinesis for repair. If you’ve tried some ordinary ergonomic keyboards with poor results, the Kinesis Advantage is a step up that you may need to take. The price tag is high, there is an adjustment period, and some elements of the design may annoy you. However, if it helps your typing-related pain, those other things are petty by comparison. Also, after awhile you will most likely learn to work around the annoying features of the keyboard and begin to enjoy some of its more subtle efficiency benefits.